With over 20 million followers, Sunny Leone is totally climbing up the ladder on Instagram popularity. Her videos ranging between hot, adorable, cute, and funny are helping the case big time. The actress took to her social media page to share a couple of new videos. The thing is she recently made her debut on TikTok and seems to be loving the app. So, for the two videos, we are going to talk about feature Sunny dancing on hit Punjabi songs. And, boy, are you going to feel the urge to get up and dance - call it the choice of songs, which are certainly foot-tapping, or call it the charm of the actress. So, Sunny first posted a video with a fellow TikTok user in which they are dancing to the hit Daler Mehendi number, Bolo Tara Rara. The number itself is catchy, and Sunny's dance moves add more fun to it. Madhura Raja Trailer: Mammooty’s Mass Role and Sunny Leone’s Glam Appearance Are the Highlights – Watch Video. Wasn't that super cute? 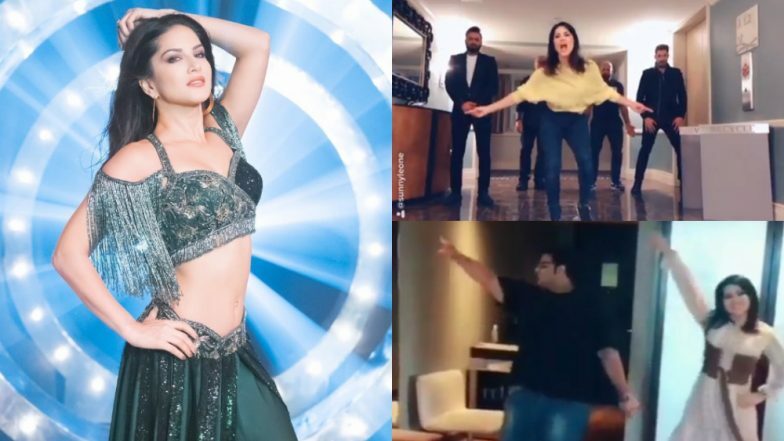 We are hoping to see more of Sunny Leone dancing to hit desi tunes and letting her Punjabi-side show. On the work front, Sunny is looking forward to her Tamil debut, Veeramadevi. The historical period drama, directed by Vadivudaiyan, features the actress playing the role of a warrior queen. Sunny will also be seen in a cameo appearance in Arjun Patiala, which stars Diljit Dosanjh and Kriti Sanon. She also has Malayalam movies Rangeela and Madhura Raja in the pipeline.